Let’s face it. Everyone has sensory preferences and mine might be very different from the person sitting next to me. When our bodies are able to get the sensory input we seek, we are ready to accept information and learn. In general, when students have the proper sensory input, their body and mind are ready to learn. 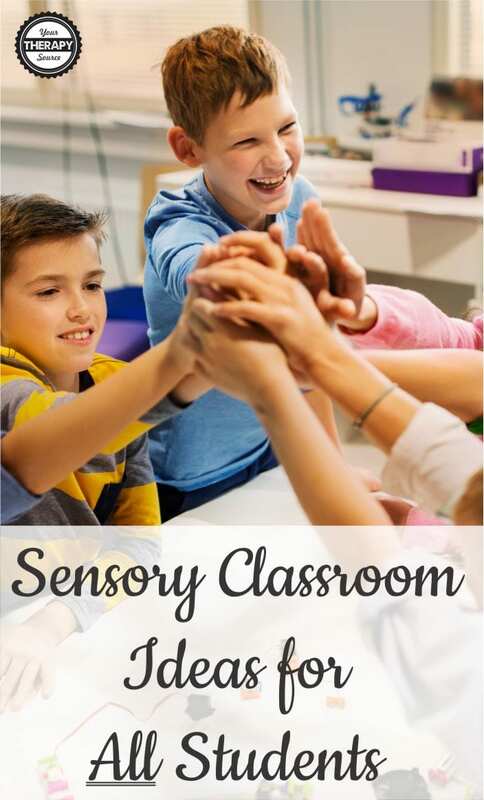 Here are ways to embed sensory classroom ideas for ALL students throughout the day. Keep in mind, there are some students who will need more specific sensory interventions. A pediatric Occupational Therapist can help evaluate and determine the proper sensory input for students. Establish a structured routine throughout the school day so students know what to expect. Provide visual schedules if necessary. Our bodies are not designed to sit all day. Keeping students active also helps to activate the brain. Incorporate movement with learning, assign students jobs that require physical activity, increase recess time and add in brain breaks. Establish an area in the classroom where students can go for some quiet time. Provide noise-canceling headphones or quiet, soft music for children to calm down. Maybe place a few pillows or comfortable seating in a corner for a calm down space. Provide visual pictures to help students relax before a test or after a stressful situation. Try flexible seating. Do you suggest or use alternative seating to keep children alert and focused in the classroom? Here are some suggestions for alternative seating in the classroom: bean bag, exercise ball, exercise ball with feet, crate with cushion, scoop seat, lap desk, stool, air disc, sit on bean bag, sit on crate, sit on stool, work on floor, sit on balls at table, stand up, stand up on balance board, sit on floor, or sit on crates at table. You can get more information on flexible seating with Wiggle Worms: A Guide to Alternative Seating for the Classroom digital download. It includes all of the resources you need to begin implementing alternative seating strategies in a classroom. Learning styles can affect a students ability to process sensory information. Try to create lessons plans that are multi-sensory i.e. tactile, visual, auditory and kinesthetic (movement). Everyone has sensory preferences. If someone has a very strong sensory preference, it can possibly interfere with his/her ability to learn. If possible, allow the students to make their own choices i.e. fingerpaint or paintbrushes, stand up or sit down, pencil or pen, etc. Research indicated that children in highly decorated classrooms are more distracted, spend more time off-task and demonstrated smaller learning gains than when the decorations were removed. Sometimes children can be LOUD! Imagine trying to learn when the noise level is too high. By establishing reasonable noise levels in the classroom it prevents overstimulation. Students may need to be taught what appropriate noise levels are acceptable. Try using a noise meter for a visual cue. No matter what the weather, schools need to encourage recess time. Whether it be free play time outdoors on playground equipment, using loose parts (ie balls, jump ropes, etc) or indoor time on rainy, cold days, students benefit from the break for some of the following reasons: self-regulation skills, sensory motor skills, mathematical concepts (spatial awareness, counting, etc), behavior improvements and physical activity time! Make sure students are educated on what your expectations are to maintain a peaceful classroom. Review classroom rules often. Fidgets or other sensory tools accessible to all students. Stress balls, velcro dots under the desk to rub or small manipulatives are nice, quiet fidgets that may help some students focus and attend.